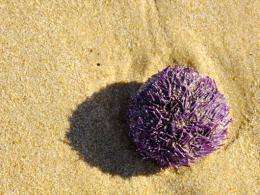 (Phys.org) -- The purple sea urchin could help develop cures for diseases such as Alzheimers and cancer, scientists at the University of St Andrews have discovered. Creatures, such as the sea urchin and sponge, have been discovered to have a special genetic sequence previously only thought to be used by certain viruses. Now these sea creatures could inform scientists how to produce a therapeutic response in our own cells. This latest finding builds on the earlier discovery of a short genetic sequence (2A) caused by viruses which can be used to return cells to a stem-cell like state  allowing them to be manipulated and used for special treatments. Martin Ryan, Professor of Translational Virology at the University of St Andrews, was the key researcher in that discovery. He said: You could put two  or more  different genes into one cell, but each individual gene would be expressed at very different levels. This process allows you to daisy-chain multiple genes into a single gene, but the different proteins made from each part of the new gene are expressed at the same level and within the same cell - which is a massive step forward. This sequence was first discovered in Foot-and-Mouth Disease Virus, but we now know it is found in many other types of virus. This sequence has been used (by other researchers) in human gene therapy clinical trials to treat a number of cancers: metastatic melanoma, for example. It has also been used to produce human pluripotent stem cells  a very important step in regenerative medicine, a treatment in which damaged tissues can be replaced. Originally the research team though the sequence was a trick played on the host cell by viruses. However, its discovery in creatures such as sea urchins and sponges indicates that it is used by cells themselves, and in in many different types of animal. More information: The research was funded by the Biotechnology and Biological Sciences Research Council (BBSRC), the Wellcome Trust and the Medical Research Council (MRC).